If you don’t know South Sudan-born model Grace Bol from the Victoria’s Secret runway (this year marks her second time in the show), you might recognize her from designer runways like Balmain, Burberry, Kenzo, Givenchy, Lanvin, Ralph Lauren or Roberto Cavalli. Or maybe from the pages of Vogue Germany, Vogue Poland, Vogue Australia, Harper’s Bazaar, L’Officiel, V Magazine, WWD, The Wall Street Journal and many others. Bol is far more than a pretty face, however. Having fled South Sudan’s civil war with her family speaking no English, Bol is reserved, humble and grounded. We caught up with the jet-setting model and asked her our quickfire questions. The first thing I do in the morning is… have a cup of coffee after washing up. The last thing I googled was… the weather in the next country I will be in. If my days had one extra hour… I’d take a long walk wherever I am in the world. The best beauty advice I ever received was… from all my favorite makeup artists backstage and on set, how to put on the right color for my skin tone under my eyes and on my lips. My desert island beauty product is… oil, any kind of oil. My favorite healthy travel snack is… almonds…if I don’t forget to bring them with me. When I have free time… I like to watch a movie or an old TV show like Full House. It’s one of the shows that me and my family watched when we first moved to the U.S. and didn’t know how to speak English. This holiday season I plan… on spending some quality time with family and friends. My guilty pleasure is… shopping. When I have a big blemish the day before a photoshoot… I use warm water and a towel to clean my face well and then I apply some oil and go to sleep. When it comes to working out… I try to run at least once a week. A career achievement I’m dying to check off is… to walk for Prada, Alexander McQueen, Louis Vuitton, Calvin Klein and Chanel. The foods and drinks I enjoy a lot of are… coffee and avocados. My most memorable travel experience was… aside from all the beautiful places I get to travel to for work, like Greece, the Bahamas, China, etc., I would say Africa visiting my family. I’m dying to splurge on… people who are in need of simple things like clothes, food, clean water and shelter. What people don’t realize about Victoria’s Secret is… to me the Victoria’s Secret Fashion Show is a show where women can express themselves in their own unique ways and give love to the world. My favorite places to shop are… small boutiques and outdoor shopping places. The best advice for looking great in a photo is… be yourself. My most treasured possession is… my family. My biggest fashion regret is… I have no regrets because I’m happy with how far I have come. One thing I wish people knew about me is… that I am a country girl at heart who loves animals. 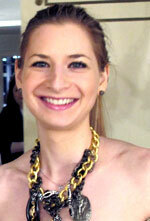 TheFashionSpot's Lifestyle Editor, Sharon Feiereisen, is a freelance lifestyle writer based in New York City. Her work has been published in Newsday, The Knot, AM New York, WHERE New York, Dan's Papers, and Hamptons Magazine, among many other print and online outlets. Check out her tumblr blog, Random Happenings.